Fall activities and events in Hudson, Roberts, Hammond and Baldwin, WI along the historic Yellowstone Trail in St. Croix County. 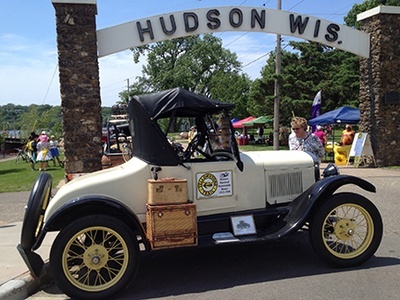 Vintage and classic car show at Lakefront Park in downtown Hudson, 5K race in Roberts, pancake breakfast in Hammond, fall harvest at honey farm in Baldwin. Other events include booya, craft fair, geocaching and CITO, tree maze, crafts, yellow tag sales, history and museum tours. A pre-event canvas party painting Fall Dusk on the Yellowstone Trail will be Saturday, Oct. 6 at My Sister’s Garden. Take an old fashioned Socialability Drive along the historic Yellowstone Trail in St. Croix County and see local landmarks and enjoy some leaf peeping. Join us for these great activities! 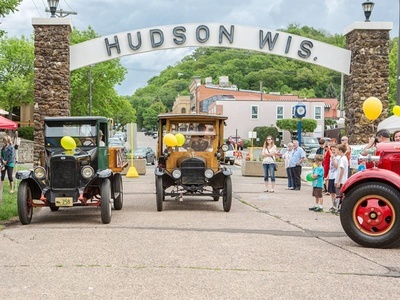 Learn about Hudson’s early history. Guided tours on the hour. Last tour starts 3 p.m.
to the Roberts-Warren Fire Department.